I recently blogged about definitions and how the definitions of myself change almost constantly. Through these changes I am always aware of the opportunity for growth, even if I experience some growing pains. 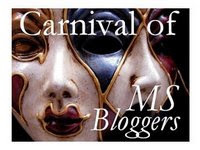 We'll I'm proud to announce that this weeks edition of the Carnival of MS Bloggers is focused on Creativity. I'm proud to be a contributor to this weeks issue and I enjoyed learning about other people with MS and how creativity helps them. So check it out, learn about other crafts, learn a little bit about MS. Either way you are guaranteed to learn something! So check it out, discover some new blogs, make some new friends, either way you won't be disappointed. "I'm a leaf on the wind....watch how I soar - Wash (Firefly)"
It amazes me how fast things can change. The past few weeks have taught me some valuable lessons about life, knitting, and....... well....... life with knitting. I returned home this Saturday after a 5 day stint in the hospital and a 4 day excursion at a acute physical therapy rehab facility. Nine days, 216 hours, 12960 minutes, the longest of my life. You see when MS teams up with fibromyalgia some interesting things can happen. I experienced an "exacerbation" and boy did it knock me off my feet. I'm slowly working on my stamina and I'm getting better a little each day but it was a humbling experience. I'm using a walker now which drives me crazy but I'm thankful for the ability to walk again. I'm thankful for being able to feel my legs even if they are numb sometimes. I'm overjoyed that my left hand has gotten back with the program even though the right one is still on an extended vacation but sends postcards ever so often. I learned knitting can help through just about anything, even if it only involves garter stitch on size 50 jumbo needles. I learned that even if you think that the jumbo garter stitch troll scarf you are knitting doesn't exactly showcase you capabilities non-knitters will be impressed by your ability to turn yarn into something pretty. On one of the days at the rehab center one of the discharge nurses stopped by for me to sign some paperwork, she was very soft spoken until she saw the knitting on the couch next to me and then she exclaimed "OOOOOOO KNITTING!!!" If I hadn't already been laying down I think I would have been knocked over as she circled the bed to see the yarn. I learned that my friends and family are pretty awesome and for the most part are a lot better in a crisis than I am. I learned that while my cognitive ability may wax and wane depending on the MS I have a random knack for remembering quotes from the show Firefly and subsequent movie Serenity. One of my favorite quotes is "I aim to misbehave" and that is exactly how I felt during the last few days of physical therapy. I've never felt quite like a caged animal until I was at the rehab center. I think its because I was feeling better and was more aware of my surroundings and all I wanted to do was to go home. One of the wonky things about MS is cognitive dysfunction and for me that normally involves confusion and disorientation. I won't necessarily understand where I'm at or how I got there sometimes it can be quite frightening and other times its just a tad annoying. During the initial stay at the fabulous UCSD medical center (they were AMAZING!) I was confused a lot of the time which was a combination of the pain I was under and the MS playing with my two remaining brain cells. Luckily through it all I've managed to maintain my sense of sarcasm, I like to think of it as a major coping mechanism. I am so overjoyed to be home, to walk, to use my hands, to be with my pets, to knit on something other than garter stitch (Adara's making slow progress but progress none the less). It so cheesy but there really is no place like home. One of the most important lessons I've learned and continue to learn is energy conservation. Things may take me a bit longer than they used to but it doesn't mean I have to stop doing what I want to do. I just have to do it different and that's OK.